iam not an artist, but i thought i can share my low poly character. It is rigged using Riggify and contains only 628 verts. The texture i made is really ugly but the inverse kinematic features are neat to make good animations. I used highpoly mesh from make human as base and made a low poly version around it. the high poly model is still in the blend file. Thanks, i think this model is good as placeholder, just tryed to make animations, and saw that some joints have a bad bent(elbow, ankle, neck and fingers). i think i have to add there more polygons. Well you usually don't draw anatomy like that, you sculpt it. 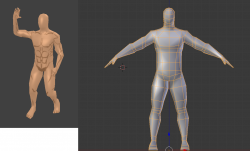 You can dublicate the mesh, subdivide it once or multiple times, so you have more polygons, then you go into sculpt mode and sculpt the muscles, then you can still bake it to the low res version. well i have a high poly model in the blender file, i used make human and generated a character with 17k tris(originally 32k but then i deleted the inside of the mouth and eyes), then i built the mesh around it. afterwards i tryed to bake a normal map but it has bugs. and i cannot fix it. iam not an expert in such things.